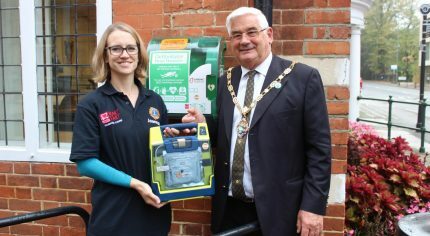 Farnham Town Council and Heartstart Farnham Lions announced on national Restart a Heart Day on Tuesday 16 October that they are to work together to produce a comprehensive list of Defibrillator Heart Restarters in the Farnham area and want to urge local businesses to get involved. Defibrillators have a huge impact on survival rates for anyone who suffers an out of hospital cardiac arrest, increasing it from under one percent to over 60 if applied quickly. These lifesaving machines are small, portable and anyone can operate one, with no training necessary. Many businesses own one of these devices for use by their own staff, however Heartstart and the council would like them to register their machines with both the South East Coast Ambulance Service and with the Heartstart team. The NHS, the British Heart Foundation and Microsoft are in the planning stages of a national register, however the Heartstart Scheme and the council are keen to get the provision in Farnham mapped as soon as possible. Tom Quinn from Heartstart Farnham Lions says: “The more Defibrillator Heart Restarters we know about, the faster they can be retrieved and taken to patients in need, dramatically improving chances of survival. Tuesday 16 October was international Restart a Heart Day and in Surrey, the South East Coast Ambulance Service teamed up with the British Heart Foundation and St John’s Ambulance to provide free CPR training in schools and community groups. Members of the Heartstart Team supported on several of these events and felt this would be a good time to ask for help from the local community. If your business or home has a defibrillator and you are happy to have it registered with the ambulance service and the council, please email heartstartfarnhamlions@hotmail.co.uk or drop into the Town Council office in South Street. To book on a course to learn to save a life, please go to www.heartstartfarnhamlions.co.uk.